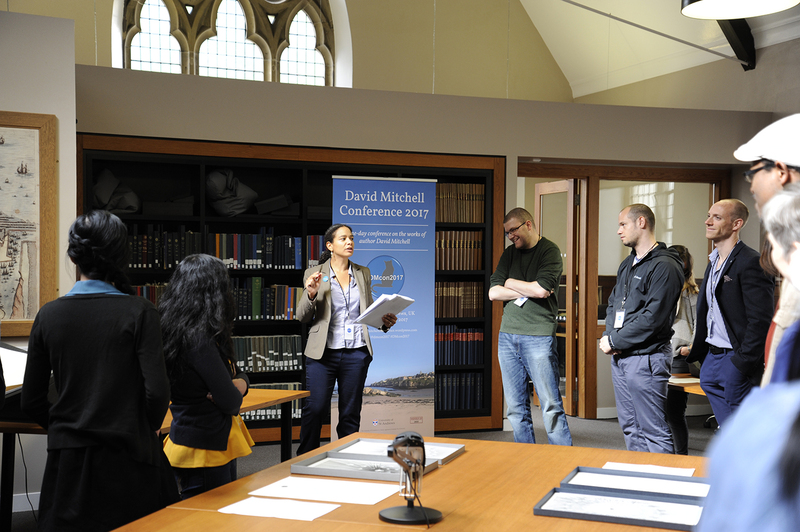 On Saturday 3rd June, fifty attendees came together from across the globe to take part in the international David Mitchell Conference 2017 at the University of St Andrews. 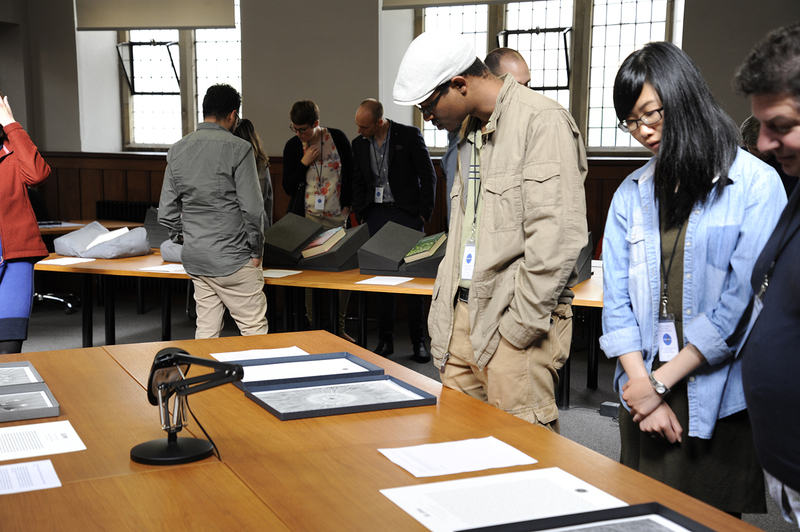 This one-day event brought together twenty speakers from ten countries to discuss the works of the award-winning author, with attendees treated to a visit to see the unique collection of rare materials and collaborative works held in Special Collections – and as the conference organiser, and author of a PhD on David Mitchell’s works, it was absolutely wonderful to see it all come together. Having sold out nearly three months in advance, the conference saw attendees travelling from Europe, the US, Canada and New Zealand in order to take part. It was also attended by David Mitchell himself, who generously gave up his time to attend, listening to the talks throughout the day and contributing to discussions with both humility and good humour. 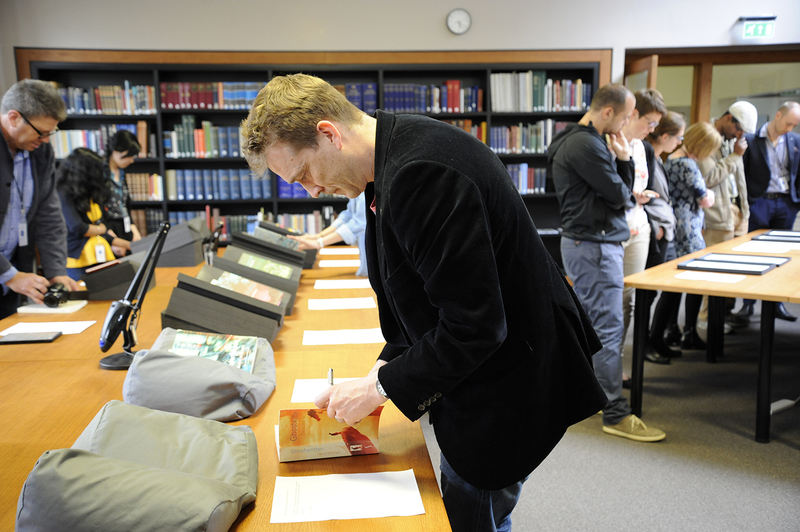 David Mitchell also took part in the trip to Special Collections, answering questions on the collection of his rare materials on display in the Reading Room, and signing the full set of first editions of his novels held by the University. During the visit, Rare Books Librarian Elizabeth Henderson gave a brilliant talk on building collections on contemporary authors, giving attendees an important insight into the processes involved in working with living authors. The David Mitchell Collection includes three rare box set collaborations with London-based artists Kai and Sunny: Caught By The Nest, The Flower Show, and Whirlwind of Time. Each set of A3 prints was made to go with Kai and Sunny’s series of art exhibitions, each of which featured one of David Mitchell’s short stories alongside intricate prints from the exhibition. There are only fifty of the limited edition box sets Caught By the Nest and The Flower Show, and only twenty-five of Whirlwind of Time, so the University is extremely fortunate to have all three of these beautiful pieces available for public viewing; see the Special Collections blog on Caught By The Nest for more information on this work. The collection also includes the anthology Fighting Words, one of only 150 hand-printed books which includes a short story written by David Mitchell, as well as rare works by other contemporary authors, including Sam Shepard, Joyce Carol Oats and Salman Rushdie. 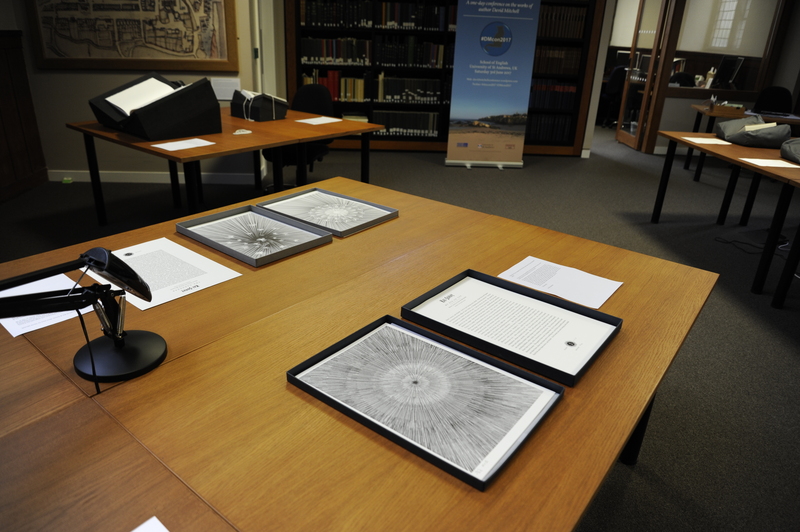 Other works on display included rare materials on the author’s libretti for the operas Wake (2010) and Sunken Garden (2013). During my research into Wake, I uncovered privately-held video footage from its first performance, and with the kind permission of the owner, I was able to make copies for both the University of St Andrews and the University of Amsterdam, where the opera’s official performance archives are held. As part of my research, I had also conducted a series of interviews with David Mitchell, Wake’s composer Klaas de Vries, and the original cast of Sunken Garden, and I was delighted to donate a printed copy of the interview transcripts to Special Collections to help future researchers. 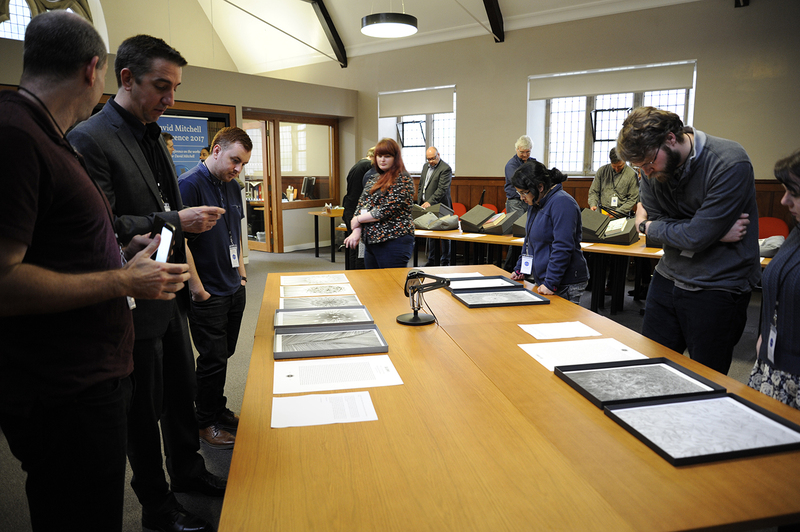 Several attendees asked how this collection of rare materials had come to be in St Andrews. During my three years of research into his works I uncovered each of these materials one by one – and so each has its own story. For example, while researching a book chapter on the author’s libretti for David Mitchell: Contemporary Critical Perspectives (Bloomsbury, forthcoming), months of searching through research dead-ends finally led to a copy of Wake’s original footage, held by a private owner in Germany, who very kindly agreed to share it with me to help with my research. Some of the works were found simply by chance; after interviewing David Mitchell, he got back in touch to let me know that he was having a clear-out, and very kindly offered to send me two publications that he thought that I may be interested in. The books that he sent to me were two pieces that, even after years of research, I had never come across: Jealous Saboteurs (2016) by artist Francis Uprichard, a book of art works containing a short story that David wrote to go with the art exhibition, and Dreizehn Arten das Stottern zu betrachten (2016), or Thirteen Ways of Looking at a Stammer, a bilingual German-English publication of an hour-long speech given by David Mitchell at the International Stuttering Association in Lunteren, the Netherlands, in 2013. Knowing the sheer amount of research hours, human generosity and good fortune that had allowed me to access each of these works, I wanted to make them available to future readers. The School of English and the University Library very generously agreed to buy in the larger rare materials, while I was able to donate those that I had come across. 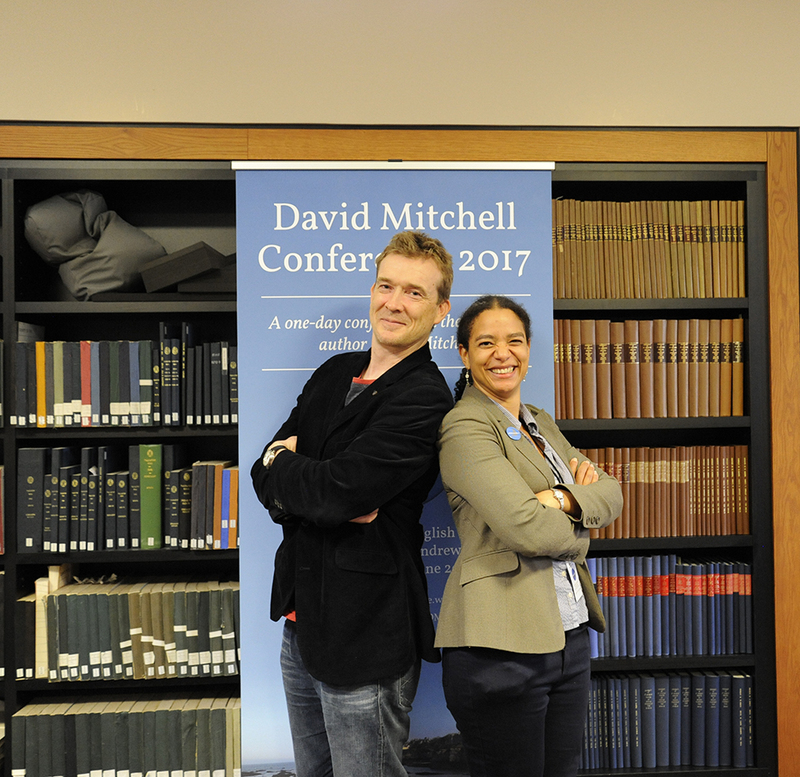 Once I had put the collection together, it was time to open it up to interested scholars and readers alike; the David Mitchell Conference 2017 presented the perfect opportunity to do so. The day sold out so quickly that I put together a waiting list for those hoping a space would open up; others had contacted me from overseas to say that they would have loved to attend, but simply weren’t able to travel over. So in order to make the conference as widely accessible as possible, events and photographs were live-tweeted throughout the day using the hashtag #DMcon2017, while the author’s evening reading was filmed. The conference also attracted national media coverage, featuring in The Herald (‘Arts News: David Mitchell in St Andrews’). As well as literary critics, the conference was attended by philosophers, psychologists, physicists, a medical doctor, a filmmaker and even a cognitive neuroscientist, so it was brilliant to bring so many different perspectives together. Thank you to all who helped to make the conference such a huge success, and to all who came, as well as to the School of English, GradSkills, the Student Project Fund and Special Collections for their generous support. To find out more about the day, see the conference website at https://davidmitchellconference.wordpress.com/.